Distinguished, modern and masculine are a few words to describe this stunning north west facing corner Penthouse Loft located at 33 W Pender. 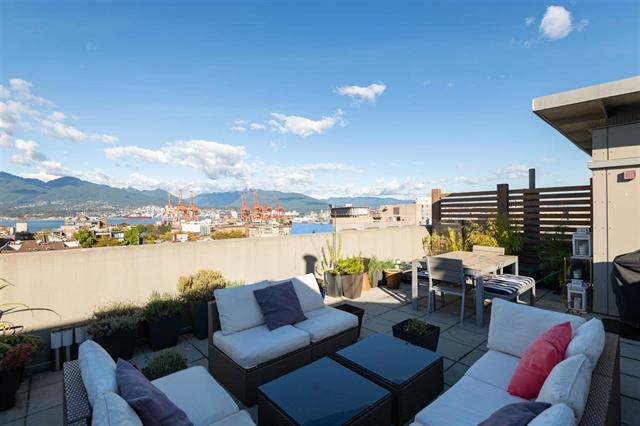 Amazing views above historic Gastown, over looking the North Shore Mountains, water and Vancouver's beautiful Harbour. Big, bright, open concept living and dining room, with floor to ceiling windows, 10ft ceilings, custom millwork, Kitchen Aid appliances, custom walnut cabinetry & large format slate floors throughout. This loft offers a quaint patio off the living room and a massive, private rooftop patio that makes summer nights unforgettable. Excellent, concrete boutique building, 2 Parking Stalls (# 2 & 3). Pets allowed (2) & Rentals welcome. OPEN HOUSE: Saturday, December 1st 2:00-4:00 PM.